In Spider-Verse, Marvel had an event that brought Spider-Men from their many alternate dimensions together for one giant battle. Many of the stand-out characters were already known to audiences - Long Live Spider-Ham? - but in Edge of Spider-Verse #2, Jason Latour introduced 'Spider-Gwen', essentially a 'What If...' character that suggested a universe where Gwen Stacy, not Peter Parker, was bit by that radioactive spider. Gwen took off fast and hard, her issue of Edge of Spider-Verse currently in its fourth printing, so it only makes sense to strike while the iron is hot. So Jason Latour, Robbi Rodriguez and Rico Renzi are back with Spider-Gwen #1, which follows Gwen's adventures in her own universe. When last we saw Gwen Stacy, she had revealed her secret identity to her father, the police captain who was hunting her for the death of Peter Parker, before vanishing to fight in an interdimensional war. She's returned now, to find the police still on her tail, the Kingpin still interested in her, and her band - the Mary Janes - hitting it big without her. Now, a new menace sweeps the streets as the Vulture premieres with a grudge against New York's only(?) superhero and she tries to pick up the pieces of her old life. This is the stuff of classic 60s and 70s Spider-Man, all very well done. Recent years have found a lot of new life in those old tropes, particularly in John Rogers' Blue Beetle and G. Willow Wilson's Ms. Marvel, which means that Spider-Gwen feels a little bit less like a breath of fresh air than it would have in the aughts. Jason Latour's plotting is fairly strong, managing to work in a number of personal plotlines that give Gwen's home-life a bit more heft while still setting up a more standard superhero adventure, though you'll probably want to read Edge of Spider-Verse #2 first, since almost all of these conflicts jump off of the events of that book. If the book's writing has any issues, it's that it's all far too familiar; Spider-Gwen doesn't really have a hook beyond 'girl Peter Parker'. 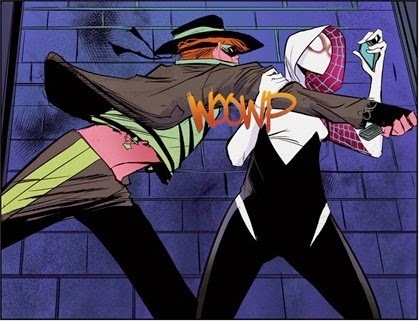 Gwen is cooler than Peter, certainly, but the conflicts are basically the same, and Spider-Gwen #1 doesn't really suggest a new way forward - though that only really matters to readers who have been immersed in these stories for years. 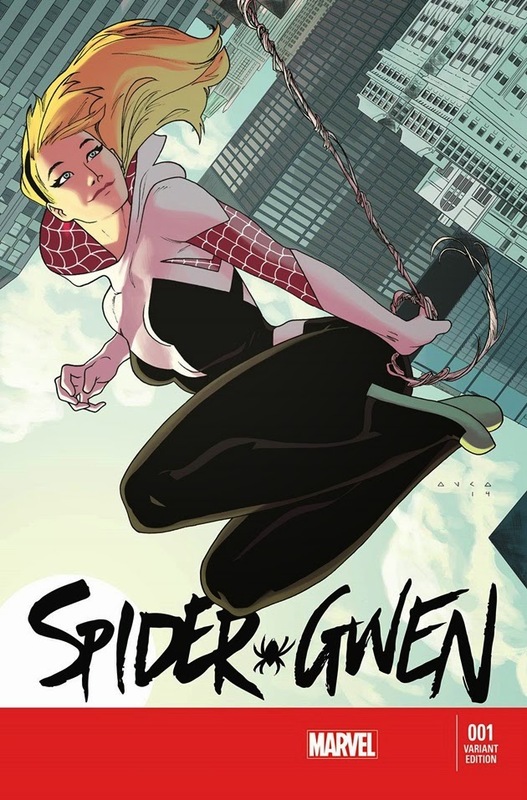 New readers will almost certainly be charmed; Spider-Gwen is well-made, an enjoyable book with an engaging heroine. Robbi Rodriguez has a lively, energetic style that gives Gwen and her world a lot of energy, a blend of the physicality of Stuart Immonen and the cartoonish warmth of Rafael Albuquerque. The heart of pretty much every good Spider-Man story - and this is very much in that vein - lies in conveying intense emotion and energy without seeing the character's face, and Rodriguez gives Gwen a desperately relatable physical personality. And he works great with Rico Renzi, who gives the book a color palette dominated by purples, pinks, and magentas, allowing splashes of brighter color to stand out against a vibrant cityscape. While Spider-Gwen is pretty much the definition of basic, there's still a huge audience for that. Latour never gets tunnel vision and makes sure to keep Gwen's supporting cast active and involved, while Rodriguez and Renzi offer up lively, inventive art and some stellar costume-design (seriously, Gwen's costume is a goddamn masterpiece, simple and eye-catching). Spider-Gwen #1 is well-made, a strong follow-up to its much-loved Edge of Spider-Verse predecessor. While it has a hard time standing out from the pack of like-minded books, particularly Marvel's own Ms. Marvel and Silk, Latour and Co. haven't lost a step in crafting an enjoyable new teen superhero comic. Spider-Gwen #1 was written by Jason Latour, illustrated by Robbi Rodriguez, colored by Rico Renzi, and lettered by VC's Clayton Cowles. Published by Marvel Comics on February 25th, Spider-Gwen #1 has a cover price of $3.99.